I have been remiss. I live in the State of Georgia, known as the Peach State, and I am just adding a Peach Cobbler recipe. My only excuse is that peaches taste so wonderfully sweet and juicy that most of the time we eat them just as they are, before I have a chance to bake with them. A cobbler belongs in the family of old fashioned homespun desserts that have interesting names like crisps, crumbles, slumps, grunts, brown bettys, and pandowdys. What they all have in common, besides their funny names, is their thick bubbling layer of juicy sweet fruit covered with a crust. The crust does vary by dessert, and for this Peach Cobbler we use a biscuit (or scone) dough. The dough can be either dropped by spoonfuls on top of the fruit, or it can be rolled and cut into biscuits (done here) before placing on the fruit. Either way, you end up with beautiful mounds of golden brown biscuits that are crisp on the outside and soft and flaky on the inside. 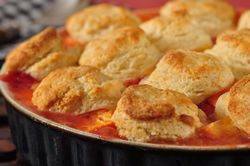 Some say the biscuits look like cobblestones, which may be where the name "cobbler" comes from. The other theory is that "cobbler" comes from the expression "cobble up" which means to put together in a hurry. Of course, the peaches that lie underneath the crust must be of excellent quality, so make this dessert in the summer, when peaches are in season. There are two types of peaches, 'Clingstone' and 'Freestone', with many varieties within each classification. The names (Clingstone and Freestone) refer to how easily the flesh of the peach separates from its stone. The Clingstone (available in late spring/early summer), is exactly that, the flesh clings stubbornly to the central stone or pit. Freestones (available late summer), on the other hand, have a flesh that is easily separated from the stone. I bring this up because how the stone is removed depends on the type of peach. For Freestones, all you need to do is cut the peach in half, and you can easily pull the stone from the fruit. Clingstones are different as you will have to cut the flesh from around the stone. Peach Cobbler: You will need a 9 inch (23 cm) round deep dish pie plate or an 8 x 8 x 2 inch (20 x 20 x 5 cm) oven proof baking dish. Place the baking dish on a large baking sheet to catch any drips. To remove the outer skins of the peaches, first dip them into a large pot of boiling water for about 30 - 90 seconds, depending on their ripeness. Then immediately transfer the peaches to a large bowl of ice water (this stops the cooking process). Let cool for a few minutes and then the skins should slip easily off the peaches. Cut the peaches in half, remove the stones, and cut the fruit into thick wedges. Place the wedges in a large bowl and toss with the lemon juice to stop discoloration. Add the raspberries, if using. In a small bowl, stir together the sugar, cornstarch, and ground cinnamon. Sprinkle this mixture over the fruit and toss gently to combine. Pour the mixture into your pie plate. Then preheat your oven to 375 degrees F (190 degrees C) and place rack in the center of the oven. Biscuit Dough: In a large bowl, whisk together the flour, sugar, baking powder and salt. Cut the butter into small pieces and blend into the flour mixture with a pastry blender, two knives, or your fingertips. The mixture should look like coarse crumbs. Add the milk to the flour mixture. Stir just until combined. Do not over mix. Knead the dough gently on a lightly floured surface and then roll or pat the dough into a circle that is about 1/2 inch (1.5 cm) thick. Then, using a 2 inch (5 cm) round cookie cutter, cut the dough into rounds. Place the rounds on top of the fruit. Brush the tops of the biscuits with a little cream. Bake for approximately 30 - 40 minutes or until the fruit juices are bubbling and the biscuits are golden brown and a toothpick inserted into a biscuit comes out clean. (If the biscuits are getting too brown during baking, and before the fruit juices are bubbling, cover loosely with a piece of foil.) Remove from oven and place on a wire rack to cool slightly before serving. Bloom, Carole. The International Dictionary of Desserts, Pastries, and Confections. New York: Hearst Books, 1995. The Moosewood Collective. Moosewood Restaurant Book of Desserts. Clarkson Potter/Publishers. New York: 1997. Rombauer, Irma S., Rombauer Becker, Marion & Becker, Ethan. The Joy of Cooking. New York: Scribner, 1997.